Grew Up… in the wealth and pomp of being the daughter to an oil millionaire, who has since past away. Now, she's as posh as her well-to-do widow mom, Jessie Stevens, who spares no expense in their luxuriating. Living… in hotel after hotel on a seemingly endless vacation. In fact, her and her affluent mother Jessie arrive at the Carlton Hotel in Cannes with jewelry amounting to over half-a-million dollars. At the hotel, Jessie spots the handsome incognito jewel thief John Robie and tells her daughter that she wouldn't mind buying him for her. Profession… heiress, but unlike her larger-than-life mother, she is more aloof and distant. However, in order to prove to her mother that she's not the prim and proper girl she might think she is, she boldly makes a move on John, and the two flirt throughout most of their time at the hotel. Relationship Status… attracted to John. 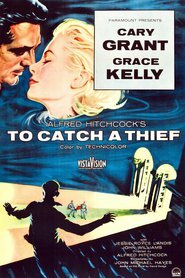 She admits to him during a car chase that she knows that he's the infamous wanted burglar on the French Riviera, despite him swearing he isn’t. When the two enjoy a night in her suite watching the fireworks, real fireworks begin: "If you really want to see fireworks, it's better with the lights out. I have a feeling that tonight, you're going to see one of the Riviera's most fascinating sights... I was talking about the fireworks." Challenge… convincing, or perhaps even seducing John into letting her join in on his exploits. Frances uses her wiles to ply John into becoming his partner – not only a romantic partner but also a partner in his adventures. A very witty conversationalist, she flirts with John, who plays aloof and hard to get despite showing interest. She even manages to engage in a catfight with one of John's former loves and manages to verbally best her. But is John telling the truth about being blameless in a recent robbery? Personality… sharp as they come, witty, and a huge, double-entendre-dropping flirt. Frances Stevens's popularity ranking on CharacTour is #3328 out of 5,000+ characters. See our top-ranked characters and read their profiles.